that is what i feel a good no ...a great shepherd should be ....confident!!!! I love LUCA more then life it's self and will never have another breed due to him .... thx buddy love mama!!!!! Thanks so much for sharing your handsome young man with us. Luca is a gorgeous black German Shepherd Dog and I wish you much luck with him in the future. German Shepherds are wonderful pets and the fact that they are so intelligent and empathetic really makes it hard to imagine your life without one if you have ever been blessed enough to own one. 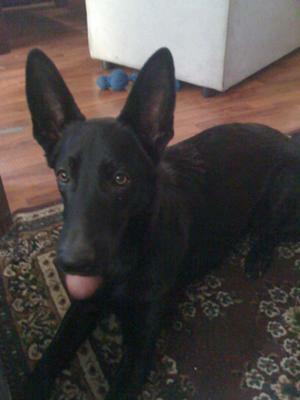 And the blacks - those gorgeous black German Shepherds - its hard to imagine another animal that could be any handsomer. Except maybe another GSD! Thanks again for sharing - we love to see German Shepherds of all sizes, shapes and colors too! Luca is a pretty boy that's for sure. You don't see a lot of black Shepherds but the body and the face are the same; those big ears, big feet and that big nose, and oh those K-9 teeth, I love it. He looks so confident and protective. They bring so much joy in your life. Take care of your boy and he will be your Protector! Hello, Jeanette, Thank you so much, for sharing Luca's story. He is so special, & so handsome. My German Shepherd, Chloe, will be 1 years old, on June 29th. Thanks again, Jeanette. Chloe, & I, wish you, & Luca, the very best, in life.